Today we finally get to Alsace-A-Palooza part three. 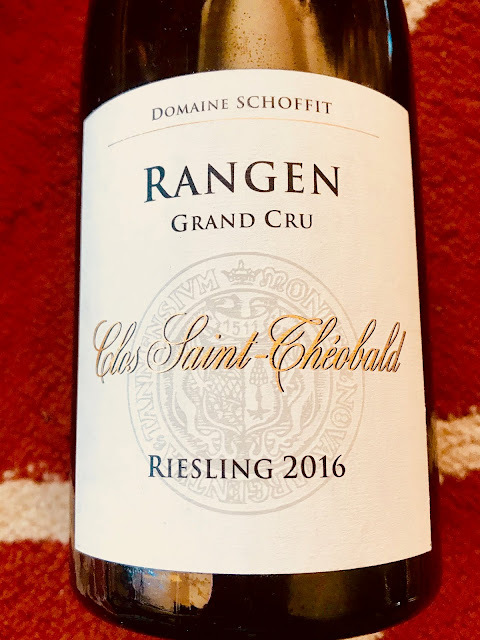 We started with a selection of wines from Alsace, then we moved on to appetizers, including flammekueche, and today it’s on to the main course! When considering what main to make for this dinner party, I thought it only appropriate that I consult one of the many great chefs that hail from this part of France. The cuisine of the region is known for being quite hearty and delicious. Alsace also boasts more Michelin stars than anywhere else in France. Perhaps then, it’s not surprising that the region is also the birthplace to an impressive parade of star chefs. André Soltner, Hubert Keller, and Jean-Georges Vongerichten are just a few names the area has produced. I looked to them for inspiration. 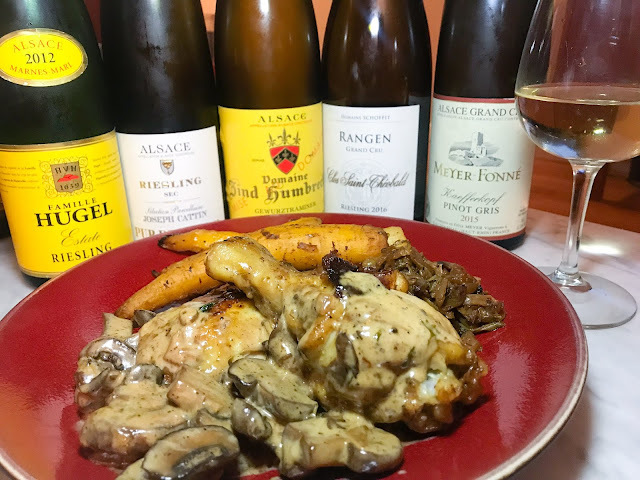 I found what I was looking for in a recipe for Chicken with Riesling by Chef Jean-Georges Vongerichten. Think of this as white wine version of coq au vin. I adapted a recipe I found on Food & Wine for a larger group by making use of the oven where I could more easily fit greater quantities of chicken in a roasting pan. Somewhere along the line, I also saw other recipes for chicken with Riesling that included a bit of nutmeg. I liked the idea and thought it would work with the hints of spice that tend to come with Alsace’s wine grapes. I didn’t otherwise intend to change very much . . . however, I accidentally made one more switch. On the night of the dinner party I went into autopilot and used chicken stock, which I always have on hand, instead of cream in the sauce. A few days later, I made more sauce to eat with leftover chicken and stuck to the recipe. Both versions were delicious. The version with cream was richer and perhaps a touch more decadent. Both were really luscious, however, and if you prefer not to use dairy and/or you want to keep things a touch lighter, the stock version is a great alternative. Chicken with Riesling made with chicken stock. Photo by Greg Hudson. 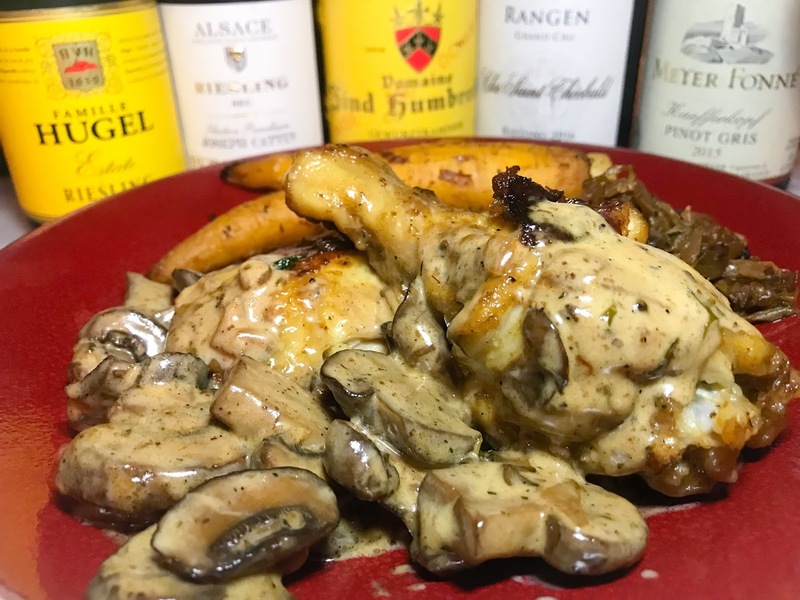 Chicken with Riesling made with cream. Photo by Nicole Ruiz Hudson. To round things out I made sous vide carrots with a little bacon jam glaze and braised cabbage. My friend Jessica also brought this White Bean and Asparagus Salad with Tarragon-Lemon Dressing by Melissa Clark on NY Times Cooking. Hugel Grossi Laüe Riesling Alsace 2011 was my favorite wine of the night. It was delicious with the chicken and became pleasantly peppery with the white bean and asparagus salad. Schoffit Riesling Alsace Grand Cru Rangen de Thann 2016 brought out the nutmeg in the chicken’s sauce in a really delightful way. The Trimbach Riesling Alsace 2013 worked beautifully with the carrots and cabbage. The Domaine Zind Humbrecht Gewurztraminer Turckheim Alsace 2014 was also delicious with the carrots. 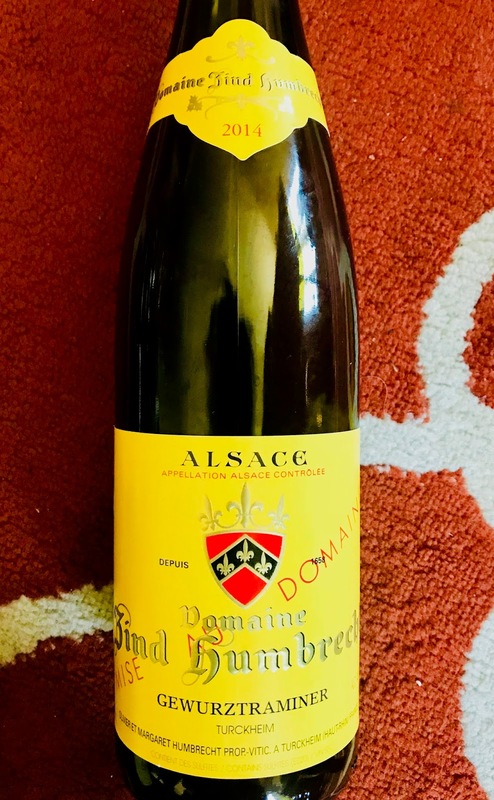 Please see Alsace-A-Palooza Part 1: The Wines for detailed descriptions on these and the rest of the wines we tasted. 2. Melt 2 tablespoons of the butter, along with some cooking oil if desired, in a large skillet. Season the chicken with salt and pepper. Working in batches, cook the chicken over moderate heat until slightly browned, about 4 minutes per side. 4. While the chicken is in the oven, clean out excess fat from the skillet and deglaze with the remaining splash of Cognac. Melt 2 tablespoons of the butter over medium heat. Add the mushrooms, season with salt and pepper and cook over low heat until the liquid evaporates, about 7 minutes. Increase the heat to moderate and cook until browned, stirring occasionally–about 3 to 5 minutes. 5. In a bowl, blend the flour and the remaining 1 tablespoon of butter. Add to the pan and allow it cook for about 3 minutes. Stir the cream or chicken stock into the skillet; bring to a simmer while gradually whisking to incorporate the flour paste. Once the chicken is ready and out of the oven, add any cooking juices to the sauce and continue to simmer until the sauce is thick enough to coat the back of a spoon. Season with salt and pepper and a generous pinch of nutmeg. Taste and adjust seasoning. Return the chicken pieces to the skillet to toss in sauce and briefly reheat. Serve the chicken with some of the sauce poured on top and serve any extra on the side. Garnish with the chopped parsley if using. Chicken with Riesling made with cream alongside some of the wines. Photo by Nicole Ruiz Hudson. This is more of a non-recipe since exact quantities aren’t required. Feel free to adjust your needs. 1. Preheat circulator to 183°F. 2. Place carrots in a heavy duty ziplock bag or vacuum bag(s). (Fill the bag, but don’t overstuff. Use multiple bags as needed.) Place a pat of butter, about a tablespoon of each the bacon jam and the mustard, a few sprigs of sage, and a generous pinch of salt and pepper in each bag. Seal bag(s) using vacuum sealer or water displacement method and put them in the water bath. Sous vide for one hour and remove from water bath. Note: It’s a good idea to weight the carrots down, as they will release gases while cooking and will try to float. 3. Braise the cabbage while the carrots are cooking. Heat oil (or a combination of oil and butter) in a large pot or pan over medium heat. Add enough cabbage to generously fill the pan with a splash of white wine and a generous pinch of salt and pepper. Cook covered for a few minutes until the cabbage has begun to soften. Uncover and continue cooking to allow some of the liquid to evaporate. Hold warm until the carrots are ready. 4. Once the carrots are finished cooking, drain the majority of the cooking liquid into the pan with the cabbage and continue cooking until the majority of the liquid has evaporated. Taste and adjust seasoning. 5. Meanwhile, arrange the carrots on a baking sheet and put under the broiler set to high for a few minutes until the carrots have begun to brown on their surface. Serve the carrots on the cabbage. I admit that I intended to have this series go up over the course of about a week and a half. Instead it’s been a touch over 3 weeks. To be honest this is because I’ve had my hands (happily) full with Bâtonnage and work. Funny enough, one of my tasting groups just explored Alsace as a topic as well. 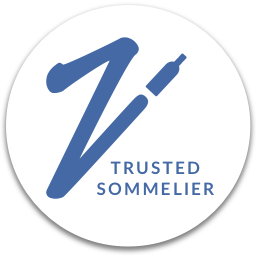 Moreover, the group was led by Cassidy Havens who led the Alsace seminar at the Wine Bloggers Conference last fall. Here are a few wines from Alsace from that tasting.